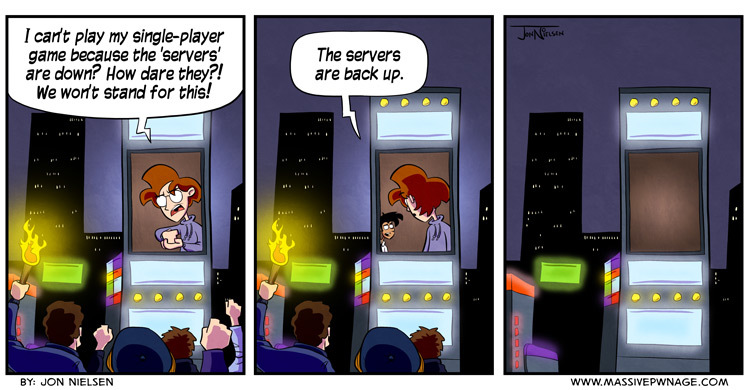 A completely accurate portrayal of Diablo 3’s launch day, submitted without comment for your viewership. This entry was posted on Wednesday, May 16th, 2012 at 12:00 am and is filed under Comics. You can follow any responses to this entry through the RSS 2.0 feed. Both comments and pings are currently closed. I saw this happening, instead of joining the mob though I just played on the European servers when the US ones were down. I just made a comic about joining the mob rather than actually joining to pass the time haha. Actually, I was half-way through making a different comic but then I had to make this one. Had to! It’s pretty accurate. Just from skimming forums and the twitter feed I could see the pitchforks and torches. All these things about Diablo 3 are just taunting me. My computer isn’t capable of running it. ._. I think the guy with the torch might be me.